We must step back in time to the 13th century to find the origin of the name of the Jardin des Tuileries, which is now listed as World Heritage in the more general context of the Parisian banks of the Seine. In fact, at that time, there were three large tile factories on this sparsely inhabited bank. But three centuries later, Catherine de Medicis bought these lands and began the construction of a palace which would be named Palais des Tuileries and would open onto a vast Italian garden linking the space of the Carrousel to the Place de la Concorde. Henry IV had this palace joined to that of the Louvre, and Louis XIV remodeled it entirely, and moreover, charged Le Notre with redesigning the garden and giving it the appearance it has today. He thus traced a central alley bounded on the east side by a round basin and on the west side by an orthogonal basin and he built two terraces, the riverside one, parallel to the Seine, and the Feuillants one (named after a former convent of the Feuillants order which was there), along which the future street of Rivoli would be opened. Very cleverly, it was then decided that access to this garden would not be reserved for the royal family but would be open to Parisians. It became accessible to all and on the terraces, cafes and restaurants were installed; for two coins, it was possible to rent a chair on the large alley. 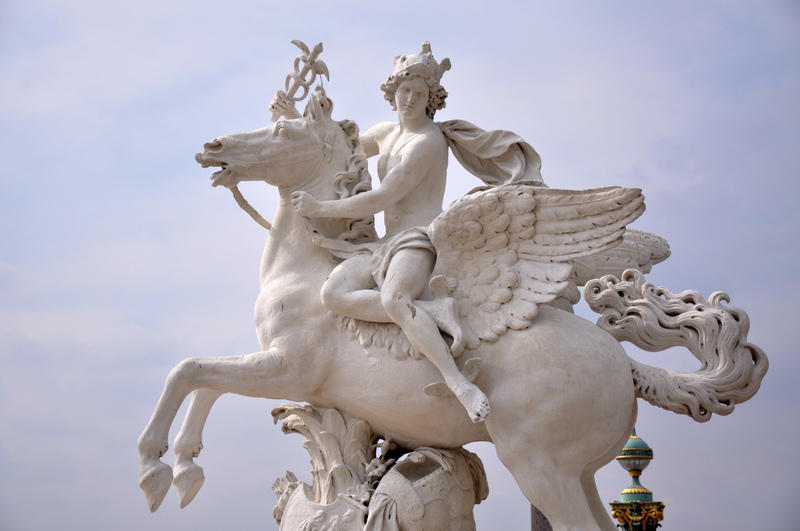 Many statues began to adorn the garden: as of 1719, the main entrance was embellished with two works by Antoine Coysevox, representing Mercury and Fame on a winged horse. Subsequently, Napoleon III, who chose the Palais des Tuileries as his imperial residence, built two identical buildings on the corners of the garden, near the Place de la Concorde: an Orangery in 1852, today hosting a museum of modern art; a Jeu de Paume in 1861, now a museum dedicated to photography. Nowadays, if nothing remains of the Palace that burned in 1871 during the civil war episode of the Commune, the Jardin des Tuileries remains one of the most pleasant public gardens in the capital. It has also become a kind of open-air sculpture museum, as it is possible to admire, alongside Rodin's famous Kiss, contemporary works by Louise Bourgeois, Henry Moore, Jean Dubuffet and even Giuseppe Penone.